Hellooooo Cat Lovers! 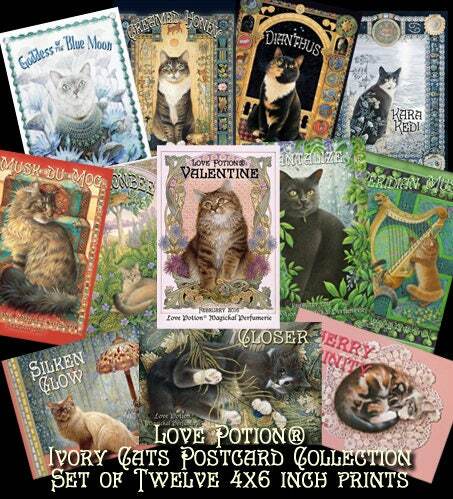 Full set of Twelve beautiful quality full color postcards of the labels from our Love Potion®: Ivory Cats Limited Edition Perfume Collection. World famous Leslie Anne Ivory awesomely licensed her images to us for this unique set. Superior quality cards - collectible, frameable, mailable worldwide! Full Color - 4x6 inches each. Lesley Anne Ivory is a legendary feline painter who has illustrated more than 40 books. Born in 1934 in Luton, Bedfordshire, UK., her ‘Ivory Cats’ – highly detailed studies of cats on rich and decorative backgrounds – have been popular on merchandise for over three decades. With a family of cats from which to select her models, she paints constantly. Check out our website for our Ivory Cats Perfume Collection!